Hi Friends, I’ve been zipping around and I had a chance to finally experience a first rate winter moment. 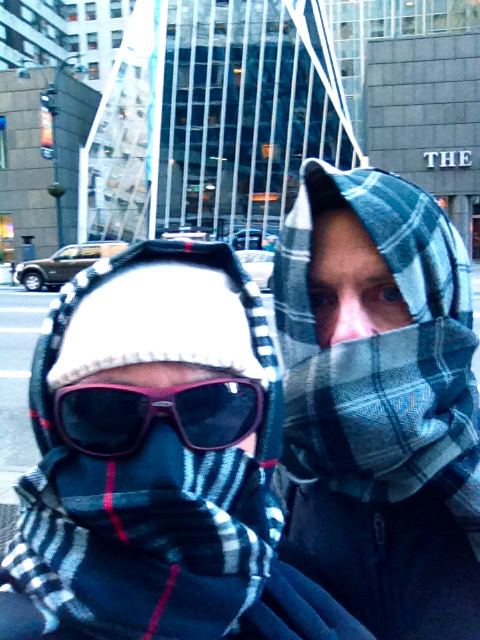 Stef and I made a trip to NYC last week and the temp was dive-bombing to 16 degrees. At that point every outdoor excursion gets valued at “was it worth it?” And thus, life indoors prevails. We were at the Chamber Music America convention, the same organization that I’m connected with through the composing grant that I was awarded. At the convention there were seminars about how to further music in the world but my favorite moments were taking in the music showcases. I heard some big time virtuosic string quartets and brass quintets made up of young Julliard devotees riding the sonic brilliance of Bartok and Haydn. Believe me, the next generation of musician is ripping it up! 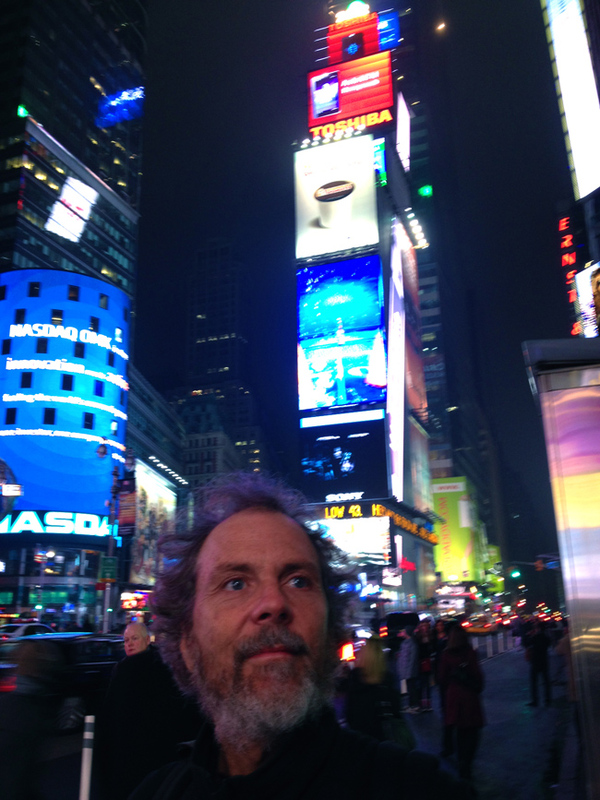 Absorbing the light in Times Square. This is Stef and me trying to make it work, taking a walk in 16 degrees. I heard the British jazz guitarist Martin Taylor last night at Dizzy’s. What a sound and flow that man has! 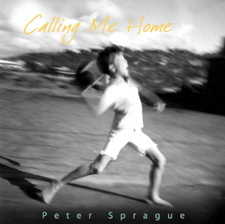 He played jazz standards that morphed through modulations and improvisations. My favorites of the night were a few of his original compositions that moved slow and reflective. Brilliant! I just got a call to head to St. Louis next week to work with Dianne Reeves and the band. I’m thrilled as we’re doing songwriting and arranging for her new record. The reason it’s in St. Louis is because 2 of the band members live there. That’s 2 out of 6 and the rest are spread out in NYC, Encinitas, Denver and Atlanta. I'm figuring “first rate winter moment” rev. 2 is coming into view. Anybody got some mittens? Tonight I’m inspired to play solo guitar and especially after hearing Martin Taylor lay down the law. I’ll be at my favorite Roxy Restaurant in Encinitas starting at 7PM. Check it out! On Saturday night I’m joining saxophonist Ian Tordella and his group for a night of Ian’s music from his soon to be released CD. The gig is at 98 Bottles in Little Italy. It’ll be a first for me to play with the group and a first playing at this new venue. Can’t wait! Let me tell you now about next week’s gig at Harry’s on 1/28. I might not get the gig email out in time as I’ll be kick-starting the defroster in St. Louis. Harry’s is a classic hang and it’s always a good ride with Bob Magnusson defining “low” and my brother Tripp exalting beauty with his melodies. Hope to see you there. Look below for the details. That’s it for now. Keep the sky in your head and keep the scarf over your ears.